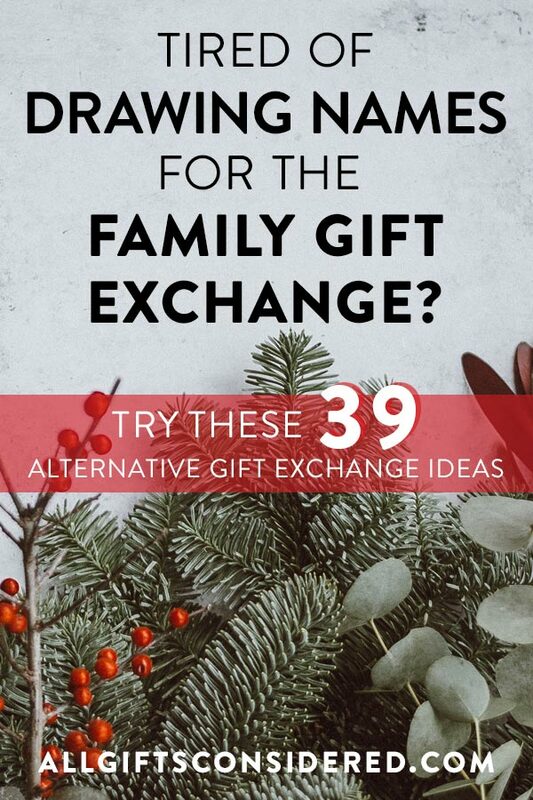 Tired of drawing names for the family gift exchange? Try one of these 39 ingenious alternative gift exchange ideas. Your family is too big to get everyone a Christmas gift, and it’s been that way for quite some time. So long, in fact, that everyone is pretty much bored to death of the ol’ “drawing names for the family gift exchange” ordeal. So why not spice up this holiday season with something a little more clever, a little more affordable, a little more fun, a little more meaningful, or even a little more… tricksy? Hmmmm….. sounds intriguing. Read on! Instead of the usual gift swapping, go in together on an experience: a special event or getaway you all can enjoy as a family. Go big and rent a beach house or ski cabin for a weekend, or keep it budget-friendly by going to a movie at the theaters. Other ideas include concerts, theme parks, laser tag, a sports event, a fun class like ballroom dancing, or rent out a family fun center for an afternoon. Have each person make a list of 10 things under X amount of dollars that they actually would like to receive as a gift. This takes away the stress of guessing whether or not they already have or would like a particular item. Plus it keeps a bit of mystery since they will only receive one or two items off the list. This could fall under #3, but we thought the idea merited its own heading. Christmas ornaments are fun, and are a big part of that warm fuzzy feeling we all love about the holidays. An ornament gift exchange is a wonderful way to add to everyone’s collection, it’s easy to do, and it doesn’t break the bank. Have everyone bake up their specialty, and bring a couple dozen extra to exchange. Kids love this, and you only have to bake one large double batch in order to get a wide variety of holiday treats. And it only costs a few dollars to make a couple batches of delicious Christmas cookies. This is the classic gift-exchange party game. It allows you to avoid having to get a lot of little, inexpensive gifts for everyone and instead choose one nice quality gift. Better gifts are given, and usually at a lower cost. Here’s how it works. Everyone buys a gift for a set dollar amount – $15 or $25 or $50. Everyone chooses a number from a hat. The first person (who gets #1) chooses a gift to open. The second person can “steal” the gift from the first, or open a new one. The third person can choose any of the open gifts, or open a new one. Each gift can only be stolen a set number of times, most of the time each item is limited to 2 or 3 steals. If a person has a gift stolen from them, they get open a new present. After all the gifts are open, the first person can choose any gift to steal that isn’t already at the maximum number of steals. Same as the Yankee Swap, but with used items you find around the house that you no longer want. The key is to get everyone on the same page. In my experience it works best when everyone is clear on the idea that “one person’s junk is another person’s treasure.” Meaning, of course, that you should bring an item that is unique or odd or interesting, perhaps useable, that someone else might conceivably want. Another classic. Draw names from a hat at the beginning of December. Use the month to figure out the perfect gift or a few small, creative gifts. Then, one by one at your family gathering, reveal your secret Christmas buddy and give your gifts. 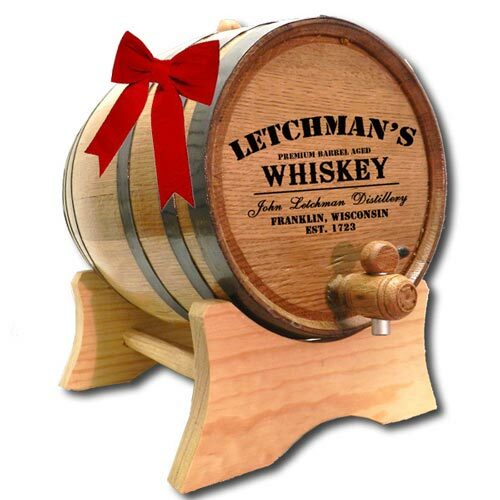 Personalized oak barrels, barrel head signs, and more from Northwest Gifts! This is an ingenious gift exchange idea for family members that live in different parts of the country. Make up a special box – maybe a wooden crate, a store bought gift box, or something you decorate yourself – and send it to a family member or friend in a different state. They then put a gift in and send it back. For multiple people, here’s how it would work. Say you have three friends or family members in different parts of the country. You would put 3 gifts inside (one for each person), and send it to the first recipient. They would take out the gift addressed to them, put their 3 gifts inside, and send it to the next person. Around and around it goes! Have everyone go in on a collection of great, top-notch gifts that are durable or reusable. (If you can’t afford it all at once, slowly build up to it.) This allows each recipient or family to use the item for a full year. Next Christmas, swap it up! You won’t have to buy new gifts every year, and everyone gets something really nice each and every holiday. Have everyone bring the very worst gift they ever received, and pass it on to a new owner. Then do it every year! Introduce new items as the old ones get lost or broken. Take a vote on the “best” worst gift each year, and the “winner” gets to wear a terrible Christmas hat. No doubt you will start all sorts of fun traditions. There will be that one excruciating gift that that everyone loves to hate; there will be stories of old gifts from days of yore that have long since disappeared; and no one will be disappointed because nobody will expect anything even remotely decent. A real winner! Instead of giving gifts to each other, invest in a child or family in need by giving through a charitable organization such as Compassion International. We recommend this organization because they are highly rated by independent charity evaluators, which provides confidence knowing that the majority of what you give is actually going to the child or family in need. Also, they have an excellent online gift catalog where you can make one-time donations towards specific needs such as a baby’s medical care, dental kits for kids, chickens to help feed a family, emergency food and water, HIV/AIDS care, and more. You probably have charities and causes that you and your family are passionate about. Band together to make a donation to something important, then enjoy a bountiful meal and holiday celebration together. This works equally well for kids and adults. We’d advise doing a separate one for each. With the kids, you can give out a gift as soon as someone gets “out,” which should eliminate any ruffled feathers or hurt feelings. After all, what kid was ever disappointed at getting a gift before someone else? For the adults, you can do the same thing. They’ll just enjoy the competition of jousting for a chair. Or you could let the musical chairs decide the order of picking a gift. You’ll come up with tons of creative ideas for gift exchanging with this one. In this version, the gifts get passed around while everyone remains in their seats. Packages are passed around in a circle, from person to person, while a holiday song or Christmas carol is played. When the music stops, whatever gift each person is holding is the gift they get! You know those Halloween carnivals, the ones often put on by churches for kids and called a “Harvest Festival” to avoid the stigma of Halloween? They’re actually pretty fun, full of little county-fair-type games like ring toss, ball toss, shooting hoops, “fishing” with a clothespin fishing pole, and more. Try setting up your holiday gift exchange with a bunch of booths where the kids (and adults!) can win prizes by winning a bunch of carnival games. Maybe give out candy or small token prizes for each game, then as each person completes all games they get to choose a gift. Use your imagination for tons of kid-centered Yuletide fun! As each person gets a correct answer, they get to choose a wrapped present, and if they get more than one question right they can pass off their gift pick to another person of their choice. Competing individually for points, the leading point-getter chooses the gift first, 2nd place second, etc. Teams compete together and write down their answers. Questions can have the same or different point values based on how difficult they are. The leading team at the end of the first quarter can choose their wrapped gifts, and the leading team at halftime can choose and/or steal from the first. Everyone opens at the end of the third quarter, and the victorious team at the very end can steal opened gifts from other teams. This one is fun to set up and fun to play. Works well with name-drawing. Have each giver tie their gift to a ball of colorful yarn (make sure each one is at least 100 yards), then hide the gift and trail the yarn throughout the house. When everyone is done, the house should look like a giant mess of cobwebs. Then the giver hands off the end of the yarn to the recipient, and the race is on! Works best (i.e., craziest) when everyone is chasing their yarn trail at the same time. You can have each person do this individually, or have all the gifts in one place for the whole family to find. Have a series of instructions, clues, or riddles that lead to the next place, ending with the ultimate treasure trove. A family-friendly take on the classic game. Everyone sits around in a circle and takes turns spinning the bottle. When it lands on you, you get to go pick out your gift. Just like the popular party game, but use a gift instead. Everyone sits in a circle, and passes around a gift. Whenever the music stops, the person holding the gift gets it. Or, to encourage passing it quickly, the person who last held the gift gets it. For more fun with larger groups, do two or three gifts at a time. There are many ways to incorporate an auction into a gift exchange. For adults, you can have a Vegas-style game night and then individuals can use their “winnings” to bid on gifts – opened or unopened. Or do a cash auction and have the proceeds go to a charity or to pay for a gift for the whole family. Set up a basic guideline beforehand – are we bidding loose change for little $5-15 gifts, or is it going to be big money for premium gifts? For an all-ages version, have some carnival games or competitions where 1st through 5th place gets tickets, poker chips, or change to use in the auction. Trivia and simple party games also work well for this: hot potato, musical chairs, a dance-off, talent show, ring toss, etc. Everyone sits in a circle, holding the gift that they brought to the exchange. (Specify beforehand a dollar amount and if there should be a particular theme or type.) The moderator will begin reading a story, and every time the word “left” occurs in the story, everyone passes their gift to the left. Every time the word “right” comes up… you get the picture. Of course you can also come up with your own story, which is half the fun anyways. Just make sure to count the number of lefts and rights so that people don’t end up with the same gift they brought! Food gifts only. Craft brew or wine gifts only. Last year you were only allowed to give experiences, like gift certificate to a golf course or tickets to the theater; this year, you can only give a subscription box. Everyone gives three used books, each from a different genre. Gifts that make people laugh; and the gift-giver that gets the biggest laugh gets a prize. You get the idea. My family did used gifts only one year, and it was one of the most unique and memorable Christmases we ever had together. It was exhausting, with lots of yard sale, thrift store, and antique mall visits, but we all had a blast. You could have everyone write down their favorite movies, and all the gifts have to relate to that person’s favorite films. For instance, a Han Shot First t-shirt for a Star Wars buff, a Sharknado triple feature for someone who loves Jaws, a sled for the Orson Welles/Citizen Kane fan, something that says “You Go Glen Coco” for the person who constantly quotes Mean Girls. Or you could do the same idea but with music – band merch, song quotes engraved onto a plaque or pilsner glass, vinyl copies of favorite albums, etc. Color – gifts must be red, or blue, etc. Do you have any additional gift exchange ideas to add? Share in the comments below! You can use Giftsoc.com to help your family create wishlists and shop from those wishlists all in one place. Our family uses it and it works really well.